The three digit number tells us Mark V* 9783 is being used for training. 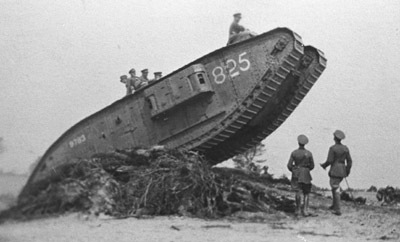 Like all military and civilian vehicles before and since, First World War British tanks were given unique registration, or serial, numbers. Beginning with number ‘1’ would have allowed the Germans to easily work out how many tanks had been built, so this wasn’t done. Later sequences also contained gaps, making the German’s job even harder. Each tank kept its serial number throughout its life, regardless of any moves between units. They were most commonly painted on the side of the vehicle towards the rear. This table lists the number ranges assigned to British First World War tanks (although not all these vehicles were actually built). *altered on recommendation of Gwyn Evans (in comments). Mark V 9263, manned by crew P1 of the 16th Battalion. 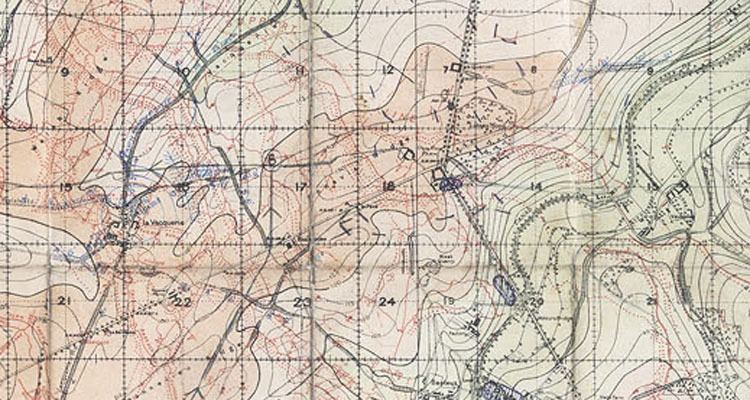 On paper Tank Battalions contained 60 crews and 48 tanks and were split into 3 Companies, with each Company split into 4 Sections. Shortages of tanks meant that although Sections were intended to have 4 tanks and 5 crews, they could often only field 3 vehicles. Crew Numbers identified the crew aboard each vehicle. They were usually painted prominently around the vehicle for ease of recognition. Unlike the serial number, they could change frequently. The numbers were alphanumeric, identifying battalion and crew, so A24 was an A Battalion vehicle and J12 contained a crew from the 10th Battalion. Although battalion names switched from letters to numbers at the end of 1917 the alphanumeric codes were kept. Officially this number designated the 8 man crew not the tank – the amount of maintenance early tanks required meant that attempts to link crews and vehicles over the longer term weren’t practical, as there was no guarantee the same tank would be available. As an example, this page from Major Philip Hamond’s notebook lists the members of crew F41 (the famous ‘Fray Bentos’), but contains no reference to which tank they crewed. Crew F41 in August 1917. They could crew any available tank. Crews usually named their tank, and these names almost always began with the letter of their battalion, for example N37 ‘Namur’ in 14th Battalion or C56 ‘Crusader II’ in C Battalion. Roman numerals after a name tell us the crew were onto their second or third tank. 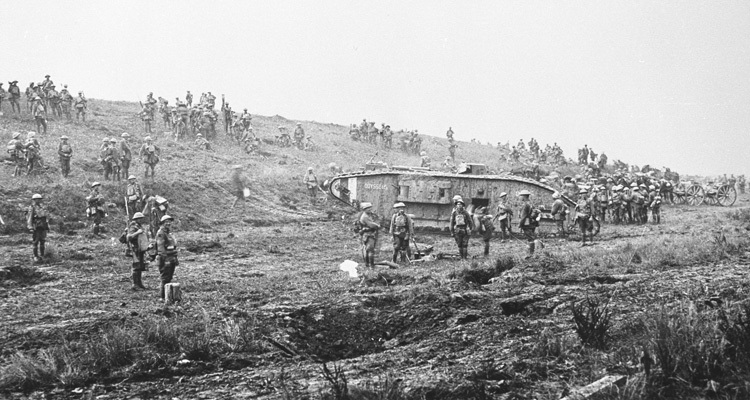 Tanks used for training in Britain were assigned a two, or later three digit number, as they didn’t belong to a battalion. 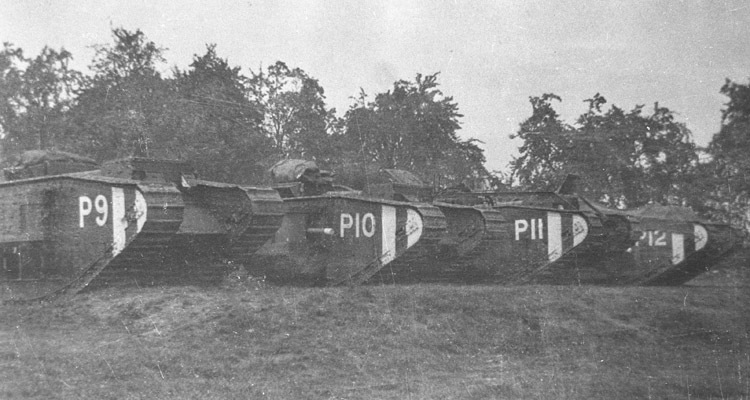 Presentation tanks distributed around the UK after the war were almost all training machines, with their numbers often clearly visible on photographs. This didn’t, however, stop the officer responsible for delivering the tank recounting tales of its exploits on the battlefield to the enthralled crowd! My Great Uncle, Private Richard Ernest Bolton, 304410, C Coy 13th. 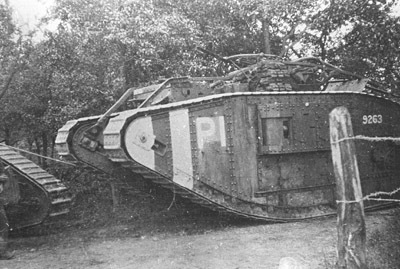 Tank Battalion, was killed in action on 8 August 1918. He was one of just 5 men of the Battalion that died that day. Based on the original CWGC Grave schedule, it appears he was in tank number 9443 (a female), which was commanded by 2/Lt. Dower MC (he was initially posted missing but was a POW) and was 2nd. Tank in 12 Section which was commanded by Capt. Fletcher. 1. 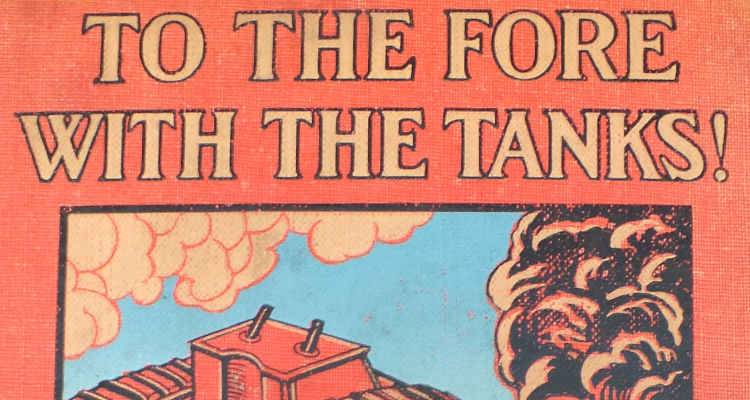 The tank C/S would have begun with an M but what would have been next? 2. Is there anymore information available on 13th. Battalion and my Great Uncle? He was originally 8th. 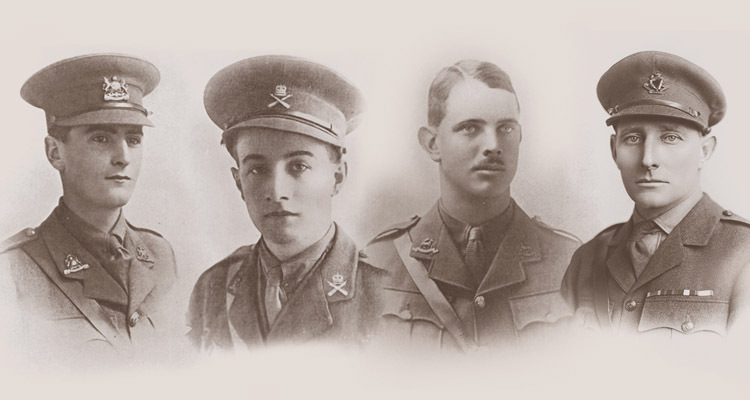 (Irish) Kings Liverpool Regiment. I cannot find his service record (destroyed in Blitz??). I have the history of 13th. Battalion (WO 95-115 2) but cannot find the War Diary on National Archives – does the Tank Museum hold these and individual service reords. The 4th Division now passed though the 3rd (OH). I’m sorry, but the list of Mark IV serial numbers is wrong. The Males were 2001 – 2100, 2301 – 2400, 4001 – 4100 and 8001 – 8200. The Females were 2501 – 2900, 4501 -4700 and 6001-6200 (6121 – 6200 were never built due to the order being cancelled). However, of these, 4526 – 4550, 6021 – 6120 and 8121 – 8200 were built as Tenders (supply tanks). This gives us the well known totals of Mark IV production: 420 Male, 595 Female and 205 Tenders. For more information on the analysis that went into finally identifying the Mark IV serial number sequences, please refer to my article “Decoding Mark IV Serial Numbers Part 1” in “Tankette” Volume 49 Number 6. 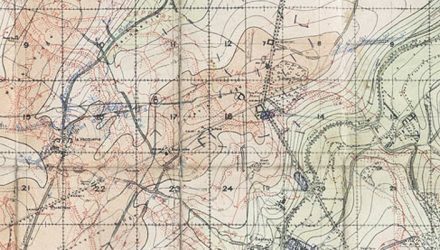 Was the notebook used by Major Philip Hamond in the article above normal for battalion commanders? Are these available in any archive? I am trying to find out what tank my grandfather drove. He was in the 10th battalion. His name was John Joseph Rowley 96594.